Oreburgh City is where you'll receive your first Gym badge. Once you enter, a trainer takes you over to the gym. Of course, Rival is already there. However, he tells you that the Gym Leader has gone to Oreburgh Mine. On the second floor of the first building, a person will give you a Dusk Ball. Also, on the second floor of the building furthest to the east, another person will give you a Great Ball. Yet again, on the second floor of the building next to the PokeMart, you can obtain a Heal Ball if you show the Hiker a Zubat. Now that you've gotten all the items to keep you happy for a while, go south into the Oreburgh Mine. 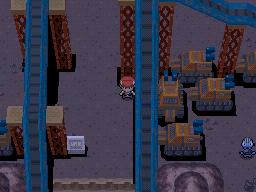 At the entrance of Oreburgh Mine, you can pick up a X Defend, or a PokeBall in Platinum. As you go deeper, you'll see workers and their Machop. You'll find a Potion to the right. Talk to the person who looks different from everyone else. That's the Gym Leader. He'll demonstrate an impressive Rock Smash and then leave. At the far left, you'll find an Escape Rope. Now it's time to go to the gym to fight for your first gym badge! The view inside the gym is much more three-dimensional than the rest of the world. 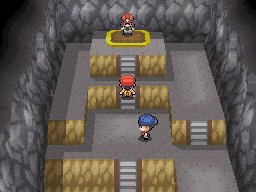 You only need to battle two Youngsters before reaching the Gym Leader, Roark (you can avoid the second Youngster by using the stairs). Roark uses a lv. 12 Geodude, a lv. 12 Onix, and a lv. 14 Cranidos. They are all Rock-type Pokemon and are very weak against Water and Grass-type moves. If you chose a Turtwig or Piplup as your starter Pokemon, this battle will be fairly easy if you've raised them enough to learn Razor Leaf and Bubble. To make it even easier you could catch a Budew on Route 204. If you chose Chimchar, you can capture a Budew or a Machop on Route 207. Using Chimchar may be more difficult, unless it knows Mach Punch, which is super effective against Roark's Rock Pokemon. After defeating Roark, he awards you a Coal Badge. This badge allows your Pokemon to use Rock Smash to smash rocks. Additionally, he gives you TM76 - Stealth Rock. Now that you've earned your first badge, first go north to Route 207. Go all the way north through the large patch of tall grass to pick up a PokeBall. Another hidden PokeBall can be found in the empty space on the right. You won't be able to go any further, since you need a Bike to go up the slippery slope. Go all the way west towards Oreburgh Gate. Rival will stop you. 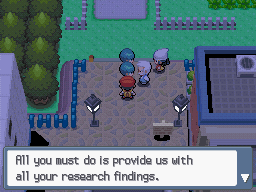 He's planning to get to Eterna City through Jubilife City. If you want to do the same, you must go through Oreburgh Gate. Now that you can use Rock Smash, go north in Oreburgh Gate and go down the stairs. By smashing many more rocks, you will be able to pick up a Stardust (Big Pearl in Platinum) and TM70 - Flash. After learning Surf, you'll be able to explore more of Oreburgh Gate. Surf west and pick up TM31 - Brickbreak at the north. If you keep surfing west, you'll get onto land and battle a Veteran. At this point, if you can use Strength, you'll be able to pick up an Earth Plate as well as TM01 - Focus Punch. Now go all the way back to Jubilife City and head north. Go towards the north and you'll bump into Professor Rowan and Dawn. They are confronted by two Team Galactic members. You and Dawn then team up to battle the Galactic Grunts. Defeating them shouldn't be too hard at this point. After their defeat, Professor Rowan tells you that Team Galactic is trying to harness the energy released through Pokemon evolution. After that, the two leave, and a staff member from Jubilife TV will give you a Fashion Case for your amazing battle. Next, you should check out Jubilife TV. On the first floor, you can battle a Reporter with a rather high level Pokemon. On the second floor, a man will give you a Mask of your starter Pokemon. Go into the dressing room on the left and talk to the man standing at the door to dress up one of your Pokemon. Afterwards, its picture is framed on the wall. Now, head north towards Route 204. After learning Surf, you can surf across the pond on the left side for a Sea Incense. You can get an HP Up by surfing across the pond on the right side. 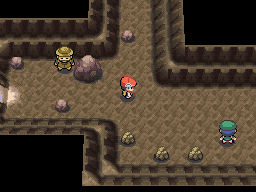 As part of Route 204, you'll enter a cave called Ravaged Path, which you may have encountered earlier. Smash the rock on the left side to obtain TM39 - Rock Tomb. Also after learning surf, you can surf north to pick up TM03 - Water Pulse and a Luck Incense. Next, smash the rock on the right side and exit the cave. Follow the path provided and you should be able to move along just fine. Pick up the Awakening next to the first trainer and TM09 - Bullet Seed past the Twins. After learning Cut, you can cut down the tree east of the Twins and talk to the person inside for TM78 - Captivate. Then you'll arrive at Floaroma Town.